Earlier this month a group of players from The Metropolitan Girls League got to visit Spain for a 5 day trip in association with DB Sports Tours. The trip took place the week beginning February 12 – 16. 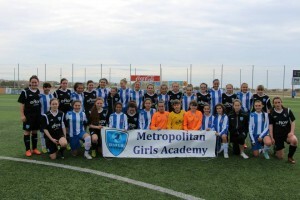 The Metropolitan Girls League recently formed through a merger of The North Dublin Schoolboys/Girls League (NDSL) and the Dublin Women’s Soccer League (DWSL). The tour, which was arranged by DB Sports Tours, was a great step forward for girl’s/women’s football, wherein not only did they get to test their wits against the class of local Spanish sides, but got to take in an elite coaching session with RDC Espanyol and then one ‘master-class’ training session where the players got to take in the intricacies of the Spanish football philosophies. All players stayed in the fantastic Cambrils Park Resort. Three games took place; the first two on the Saturday and then one on the Sunday. Firstly they played RCD Espanyol in the morning, followed by a clash with CE Sabadell in the evening. The Sunday game took place in the morning against Vilafranca. It was said the girls performed excellently in each game. For more information on trips like this keep an eye on the blog here.